← Time for Tea: Upar-Wali Chai is Back! Twelve food-lovers (including two unsuspecting tourists we roped in at the Metro station) set off on Saturday night from Chawri Bazaar. The first stop was Ashok Chaat right by the Metro, a well-known chaat joint and a safe bet if you’re new to Delhi’s street food. It’s always mobbed and that’s always a good sign! We shared several plates of Golgappe – definitely a bit more gutsy than the sanitised Haldirams version! 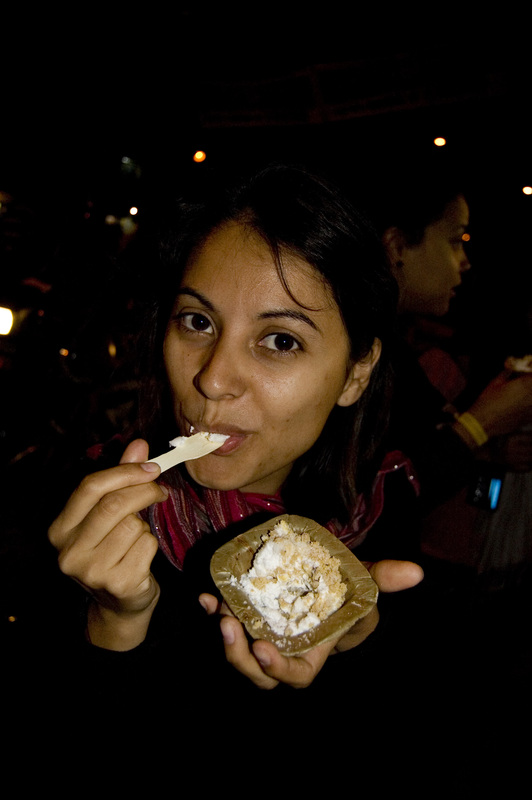 – Papri Chaat and Kachori Chaat followed by a couple of Aloo Tikkis which were sizzling at a stall a little further on. Eagle-eyed Siddartha then spotted a Daulat ki Chaat vendor and to much sighing and drooling we managed to finish his entire stock. About a third of the way down Chawri Bazaar at Hira Lal Chaat corner we ordered a plate of Kulle, an unusual chaat made by scooping out the centre of either a tomato, a banana, sweet potato or cucumber. 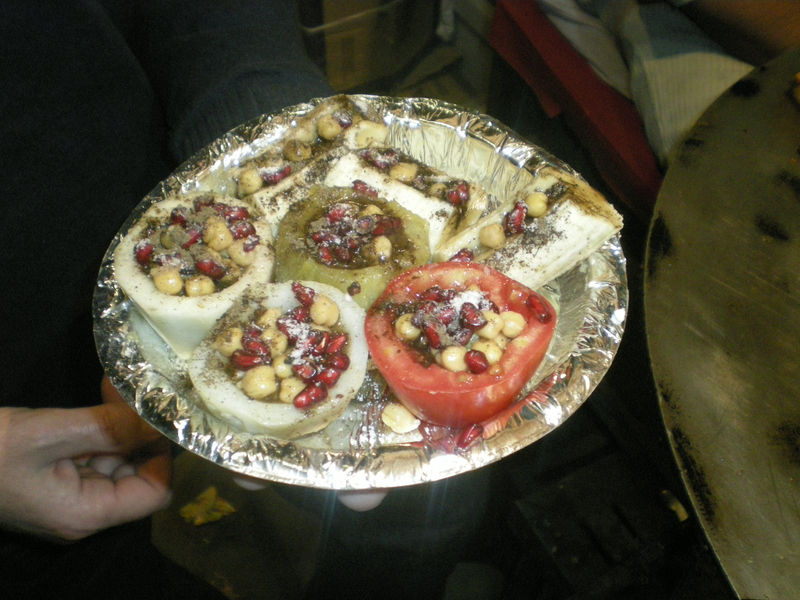 The hole is then filled with chick peas, pomegranate seeds, spices and lemon juice. A great palate cleanser for the meat-fest that was to follow. First, though, we took a detour into Raghu Ganj, a peaceful grain store off Chawri Bazaar where, since 1958, the family of Anil Kumar Jain have been making amazing fruit sandwiches. Depending on the season, this involves fruits like mango, apple and banana, finely sliced and layered with slivers of paneer, pomegranate seeds and lashings of marmalade (or Jum Jum jelly as Mr Jain calls it) between two slices of soft white bread. It sounds a bit unlikely – not a grain of chaat masala in sight – but is utterly delicious especially when washed down with one of their sensational chiku milkshakes. We walked round to Matia Mahal which, as ever, felt like Eid, Diwali and Christmas all rolled into one. Sid, from Chef at Large (palate-weary from all that ‘fine’ dining) took us to his favourite kebab stand so we could tear into some beef. Down in Chitli Qabar we went in search of a special kind of sheekh kebabs which are so soft they have to be held onto the skewers with fine string – in fact they’re sometimes called Sutli (string) Kebabs. The men who make the kebabs sit in a sort of bunker below street level turning out plates of meat that melts in the mouth. There was also some interesting-looking fish but by now we were slowing down – I’ve noted it for my next trip! Then it was Biryani time and that means Mota Biryani Wala, a very formidable-looking gentleman the same shape as his giant cooking pot who sits in a gully off Chitli Qabar. Here the gluttony was starting to take its toll so we stepped off the street and sat in the back to enjoy the exceedingly tender mutton and perfectly moist rice. Back on the main drag, we stopped for dessert at a one-stop shop serving Shahi Tukda, Phirni, ice cream and badam milk. Most people might have called it a night there and the caveman was definitely begging to be taken back to the Metro in a rickshaw but a couple of us knew the night wouldn’t be over until we made the pilgrimage to Bade Mian’s mighty kheer shop. As well as eating a couple of plates on the spot, I bought a huge pot to take home. 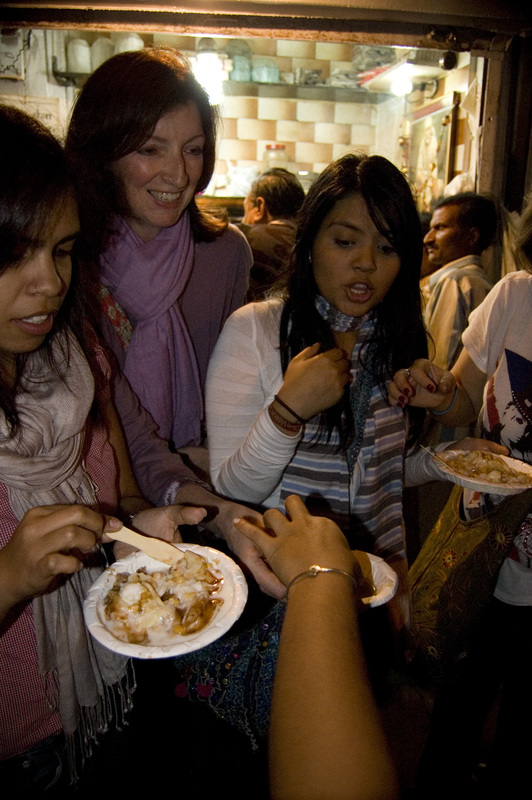 All in all an excellent evening – a treat to see new converts to eating street. You know, I could probably be persuaded to do another one! I have lived in Delhi for 26 years. Now settled in US, I do make frequent trips back home. I make a list of things to do , places to visit during my trips. Now your blog is making my list longer 🙂 Love your blog ! o! I hope you will! thanks a tonne again! 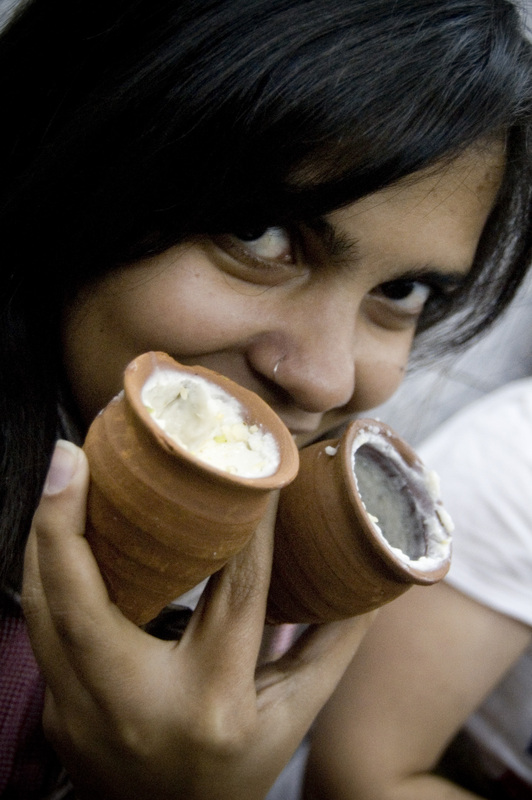 I am going to Delhi in July, this post has made me hungry already! That Kulle looks so interesting, and the fruit sandwiches too. Have got to start researching the food so I know what more things are! Thank you for this post. I’m returning to Delhi after 2 years, and I know exactly what to do! Love your blog.. Please write as frequently as you can! Is there some place in Delhi where one can get authentic Mumbaikar’s Vada Pao ? If not , some one oughtta think about it. Pamela has probably not reached Kamla Nagar,in the neighbourhood of Delhi Univ.Must try on our next nightly sojourn. Narender – having just come back from Mumbai, how wish there was some good Vada Pao in Delhi – if you find some let me know. I have been to Kamla Nagar but I’d like to go again! Notyet100 – Mumbai was great, Happy Holi! Thanks Vivek, enjoy your return to Delhi! Siddartha – I’m definitely up for another jaunt – lets try and fix a day! 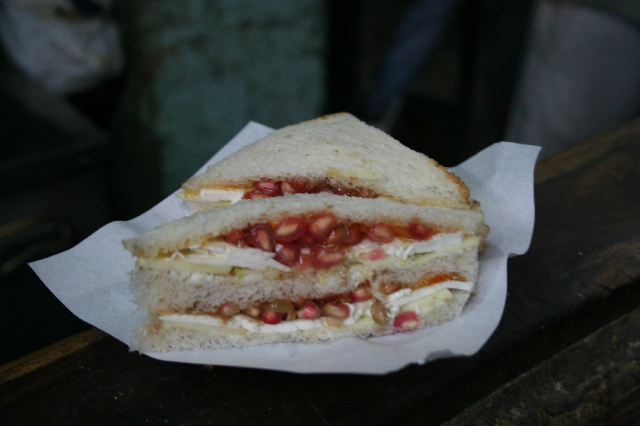 Lili – the fruit sandwiches might be just what you need when you visit – Delhi is a bit of an endurance test in July! Hi Sugato – it really makes my day to think of readers tracking down these Old Delhi gems. Glad you enjoyed it! KR – thanks for your lovely comment! Makes us want to get on the first flight back… don’t get nothin’ like that here! Pamela, I am off to Jacek’s country for a week and back only on 14th just in time for the uparwali chai. So the weekend of 20/21 March for the Delhi veggie walk? Shyam, let me know when you’re on your way! Hi Pamela….I just discovered your blog and what a revelation it is!! I’m heading to Delhi at the end of April and would love to do an exact replica of this walk. Is there any way you could put these places on a map like the one your have of the spice market in Old Delhi. It would orient me to the places so I don’t get lost. Your blog is fabulous!! I want to go on a street food walk too 😦 , but my friends are lazy bums. But, you’ve motivated me to venture out alone. The mouth watering descriptions of the street cuisine are the next best thing to actually wolfing them…I am headed for Chandani Chowk to gorge them – at least the veggie platter. The mouth watering descriptions of the street cuisine are the next best thing to actually wolfing them…I am headed for Chandani Chowk to gorge them – at least the veggie platter. Keep me posted of the new blogs. Kul Bhushan – have a wonderful time! Abhishek – I’m a regular at Old and famous – in fact was there yesterday – I just haven’t blogged about it yet! Sameer – how did you get on? Michelle – will do, just as soon as I get a minute! I read about ur post in newspapers and yes, they have been true to every word.ur blog is too good.this old delhi walk..i’m very eager to go with my friends..so could you please give some directions as to where should i start and the path to take.i live near delhi gate, so i would be hopping down there as soon as u give me some inkling of their whereabouts. thanks..
How did I get on ? I don’t understand :P. (I read abt ur blog in the papers if that’s what you meant) Woooohooo!! Finally I’ve managed to convince a few of my friends to venture out with me this Sunday to old delhi and sample all the delicacies. 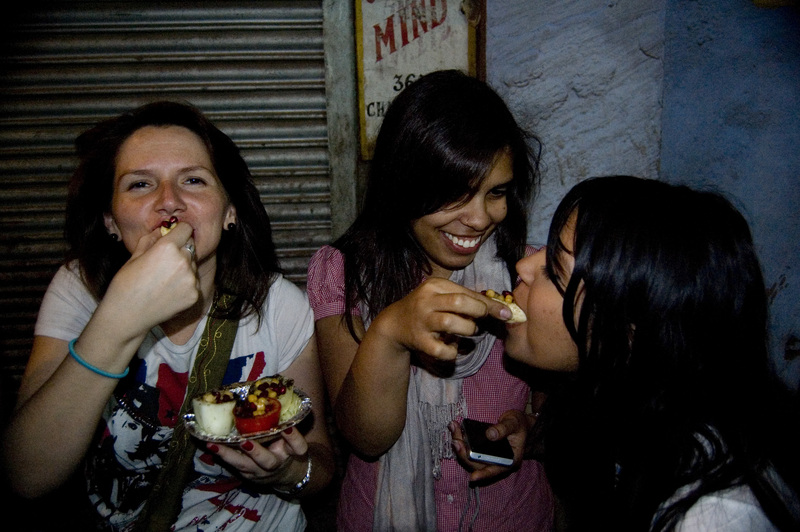 Daryaganj, Chawri Bazaar, Chandni Chowk… Yum slurp yum yum slurp !! I must try the Kulle and the Fruit sandwich. Shekhar – I’ve been trying to find the time to put up a map for that walk – promise I’ll do it soon? Sameer – Have fun and report back! Hi, I’m an old delhi resident who loves food and explorin this area. Some of your suggestions were new to me too and really loved them. But would definitely suggest you to try some more tid bits of the walled city. U must have definitely tried giani’s faluda and his winter halwas and summer shakes, but besides these Kake di hatti, Gole Hatti and Mahalaxmi Misthan Bhandar amongst others are the hot spots. Also the alternative to biscotti, Milk cake is better found in Ghanta Ghar(Just a few kilometers away) and definitely Dariba for Kurchan is a must. Try some local Sweetmeat shops like Ram Prasad Makhan Lal, Sitaram Pethe Wala(A must for Petha), etc. etc. etc. etc. Thanks for your comment – I love getting lists of new places to try! Where exactly is Ghanta Ghar – do you mean Ghantewale on CC? Are Ram Prasad Makhan Lal and Sitaram Pethe Wale both in Sitaram Bazaar? Hi again, thanx, hope this foodie could help another…………. Ghanta ghar is pretty much similar to cc but next to malka ganj (It’s actually a crossing with a watch tower in middle of it, till some time back i too thought ghantewala was at ghanta ghar) can’t remember the exact name of the shop but will get that soon. Ram prasad and sitaram are in Khari Baoli (The spices and dry fruit market at the begining of cc). Sitaram has gud pethas nd ram prasad is good with everything he makes, the owner is a bit grumpy but the food is good. There are many other small shops in the area surrounding ram prasad serving good milk products like lassi. Also have u had a taste of Chaina Ram which is at the begining of cc (Next to Fateh puri Mosque), times food ppl also do agree with it’s taste. the crisp gunjias and sev pak are out of this world……………. Do try jalebi at Laxmi Misthan Bhandar too (I like it better than dariba’s famous jalebi) actually much more crisp and fresh, also another speciality of laxmi is Bedmi and Nagori, a must try…………. The list just goes on and on………… even a personal favourite is a small shop at the corner of the crossing at azad market which serves great chole bhature, tasty milk and kulfi, Khushdil and the red headed owner serves kulfi with his sweet smile………….. just greattttt…………. are there any more such discovery walks planned? would love to be a part of it! Hi Pamela, Like Neeta I’d be interested in joining any street walks planned in the next few days. I’m here until Friday night (April 30). Michelle/Neeta – If you like, you could join a friend and I this evening: we’re meeting at 6.30 outside Patel Chowk metro station. Unfortunately, I have a business dinner commitment with my husband this evening but would tomorrow work for you by any chance. Hey Pamela…. Really nice post… I will be in Delhi on the 1st and 2nd May and then travel up north to the mountains and be back again on the 15th and 16th (both weekends) on my way back home.. Just got back from a Pondicherry food safari and would love to be a part of an Old Delhi food walk too… Thats the reason for the Delhi stay…. Is there anything planned???? Dr Kumar, unfortunately, I’ll be out of town then (enjoying some mountain cool) but follow some of the walks on the blog and you should find something good to eat! The best delivery and takeaway food in Delhi and NCR. I have tried all the so said famous and reffered food outlets famous for its deliveries and takeaways, but they all seem the same. Freshly served food is good but the one delivered top your door step loses its taste and delicacy. I have tried chinese, mughalai and fast food but its all the same. recently i got referred by one of my friend living in vaishali, Ghaziabad about the new delivery and takeaway outlet named Restaurant Ghazzala opened in Vaishali. He said the food is amazing, but i never believe unless i eat it. So one weekend we dropped at the restaurant and ordered some of the unusual items and tried them in the car. the food was amazing though the ambiance was not so appraising but who cares after you have been served some good food. I also ordered some veg for my wife and some non veg for me and my father. i took the risk of ordering Chicken Dhania Adraki and Paneer Lababdar. I also ordered some sides like Afghani chicken and some chicken lollipop and Paneer tikka. while going home i was scared of my wifes reaction over bringing home some filthy packed food. but to my amazement the food was awesome as told by my friend. My wife just couldn’t stop praising about the food till next day. until she called me up next day in the office and requested me to bring over some thing from the same place. I finally got her the delivery numbers and the menu so she could call up herself and order. i got to know that Restaurant Ghazzala have their branch in Delhi in Gazipur as well. Their delivery number in Vaishali is 7838217302/04/06. I even spoke to the owner and got to know that he has many restaurants in india and Abroad. HE is himself a trained Chef in New zealand. and speaks more than 11 languages. a very decorated man and knowlege of many international cuisines. I got to know that they even serve QUAIL( bater) in winters. Perhaps the only restaurant in delhi and NCR that server Bater. I’m coming to India in September and it would be fantastic to do something like this. I have a London based (mainly) food oriented blog as well, so I’m hoping to meet similar like-minded souls on my travels..! Pradyumm – so nice to hear from such a young foodie – glad you’re enjoying the great food of Chandni Chowk! Yeah Chawri Bazar , i knew few places there but never visited ..
let’s go on friday ..
@Pamela, Do you regularly organize such outings, If yes, who all are eligible to join the foodie gang and how can one know about such announcements? I always have some thing or the other at this place whenever on visit. Great Blog, do you publish a Nancy Chandler style map of Old Delhi street food? Let’s just say that I’ve become a huge fan of yours. Love your writing style! By any chance are you planning to have such a walk again…please please do…I would love to join it and bring along some more friends. 🙂 I’m most likely going to be leaving Delhi in a few months time and would love to do something like this before I leave. Even though I won’t have the non-vegetarian food (being a vegetarian), I would love to have the stuff I can eat and enjoy the whole experience. yes..i ( me and my wife) wud also like to be part of such of the outings…only vegiterian..thanks for making..all the wonderful contributions…great blog..and great foodies…:). yes..i ( me and my wife) wud also like to be part of such of the outings…only vegeterian..thanks for making..all the wonderful contributions…great blog..and great foodies…:). Aaarrrghghghgh… this is TORTURE! Tell me though, Pamela — how do you manage to stay so slim? Do you work out five hours a day??? hehehehe … brought back pleasant memories, thanks! 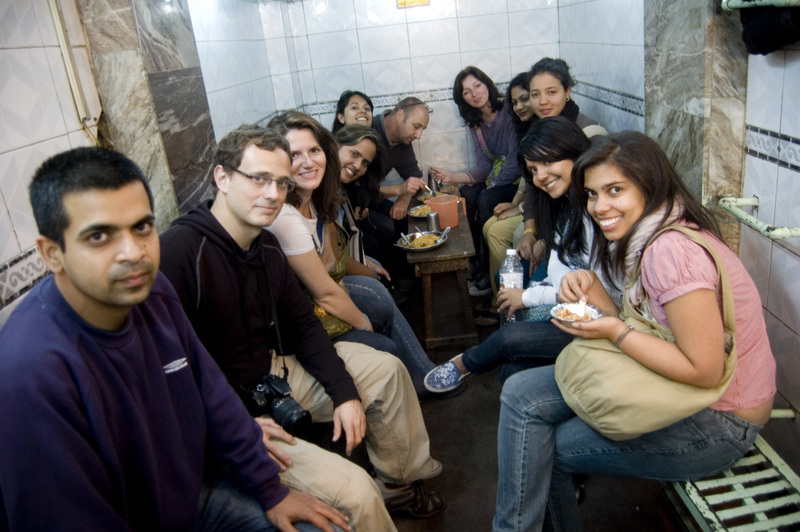 Does anyone know the name of the place in old delhi where they drop the food out of the ceiling? It was down one of the market streets. Sally – are you thinking of the restaurant in Lahore that winches food up from the street to the roof? 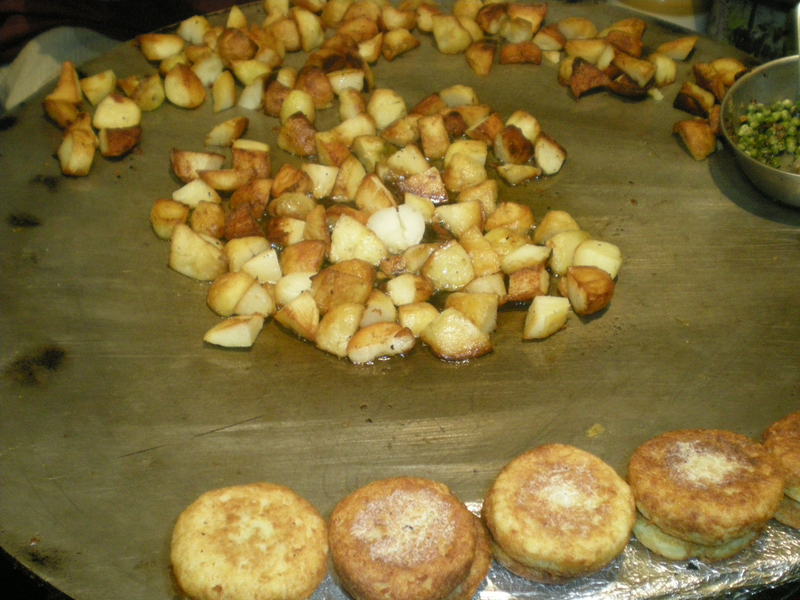 Paula – no this food was supposedly dropped from a square hole in the ceiling down to the counter. We did not order so I never actually saw it happen. I am going to write to our guide since she is the one who told us the story! Thanks for your help. could write a litte more on this subject? I’d be very thankful if you could elaborate a little bit further. Cheers! Thank you for another fantastic post. Where else may just anyone get that kind of info in such an ideal way of writing? Wrong information. The meat in Mota Biryaniwala’s Biryani is actually Buffalo meat and not Mutton. THANK YOU for this guide! … I’m really impressed and appreciate the work you do .. Thanks for taking the time to discuss this, I feel strongly about it and love learning more on this topic. of writing i am too glad to share my knowledge here with colleagues. A map with pins would be nice..